ACM SIGGRAPH membership provides access to the SIGGRAPH portion of the ACM Digital Library. To visit the library, use the link below and login with your ACM SIGGRAPH credentials. Alternately, click any of the program links on this page to go directly to program content from a past conference. ACM’s free Digital Library App is also available, and provides a convenient means to access content on your phone or mobile device. ACM SIGGRAPH members always have free access to all SIGGRAPH-sponsored materials in the ACM Digital Library. Open Access to SIGGRAPH Asia 2018 Real-Time Live! Open Access to SIGGRAPH 2018 Real-Time Live! 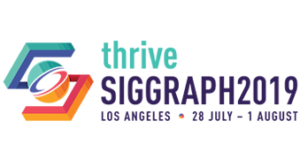 Open Access to SIGGRAPH 2017 Real-Time Live! Click the links below to reveal the open access content. DreamWorks animation presents “HOME”: just another post-apocalyptic-alien-invasion-buddy-road movie? Procedural animation technology behind microbots in Big Hero 6 (Dong Joo Byun, Henrik Falt, Ben Frost, Mir Ali, Eric Daniels, Peter De Mund, Michael Kaschalk. Please note that the links below are not open access links. Membership or per-download fee is required to access conference content for years prior to 2015.